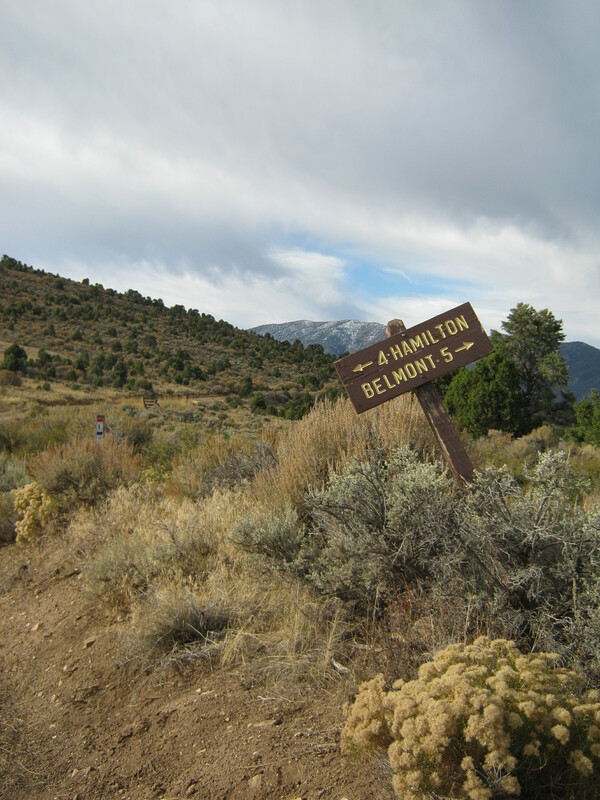 Hamilton was once the county seat of White Pine County. 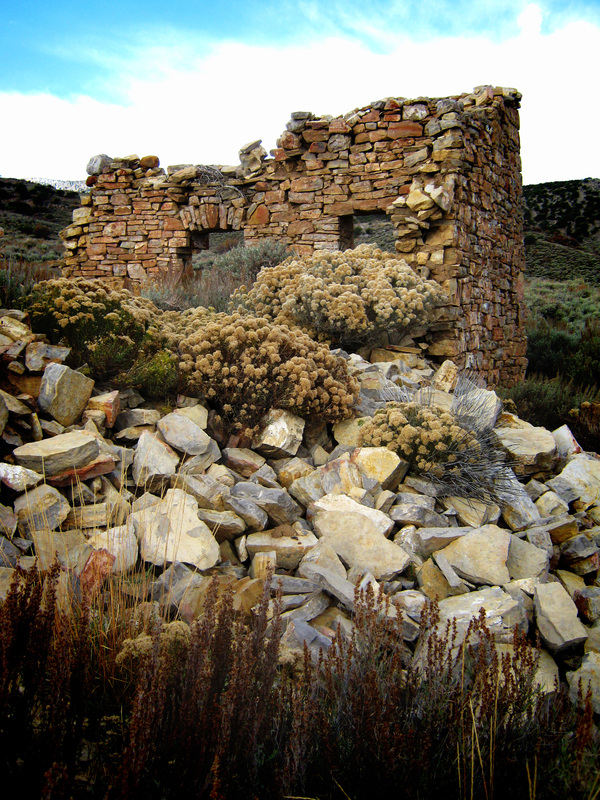 In its heyday it was a very active mining town but suffered the same boom and bust as so many other Nevada towns. The county seat moved to Ely. For a brief period the Lincoln Highway ran through Hamilton although a bypass was put in place quickly which saved about ten miles. “The Complete Official Road Guide of the Lincoln Highway” 1916 edition, doesn’t even mention Hamilton. Look at the map below and notice the town of Hamilton at the bottom of the “V” with the bypass clearly shown in yellow. As always you can click to enlarge the image. 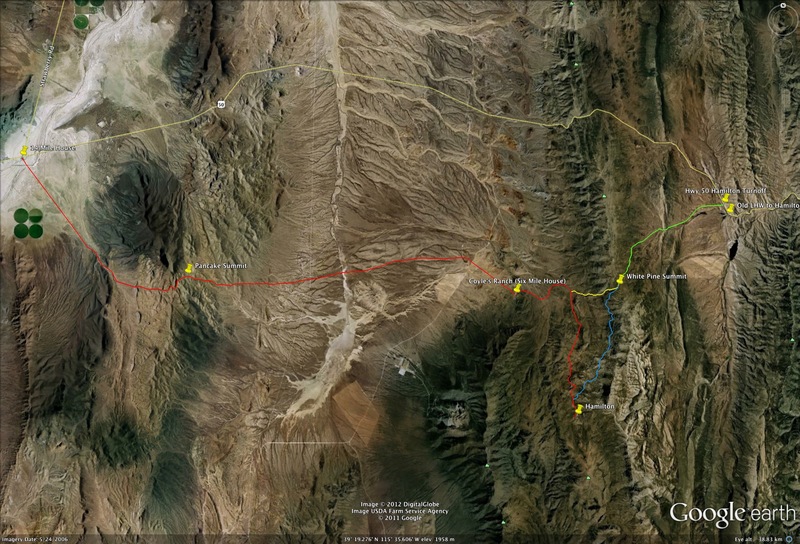 It wasn’t until the twenties and the western road building fever that this route was abandoned in favor of what became Hwy 50, a few miles to the north. The Hamilton road is to the left in the photo and the bypass to the right, labeled “Belmont”. There was recent mining activity in Hamilton so most of the road has been graded and is excellent. You might be disappointed, as I was, to find an ugly and abandoned modern metal building in the center of town. Nonetheless there are some nice ruins left, although most have been collapsing. This area is popular with Jeep clubs so you might have some company. I saw absolutely no one when I was there in October. I spent the night there but it is at 8000′ so be prepared for the cold. The Offical Guide says this about Six Mile House: “Meals, lodging, telephone, camp site” It is ten miles from White Pine Summit to Six Mile House. Once you leave Hamilton the roads can be steep and rough in places. Use common sense and have a second vehicle along. As I cautioned earlier, it’s the desert and unexpected things happen. You are miles from help and cell phones don’t work. 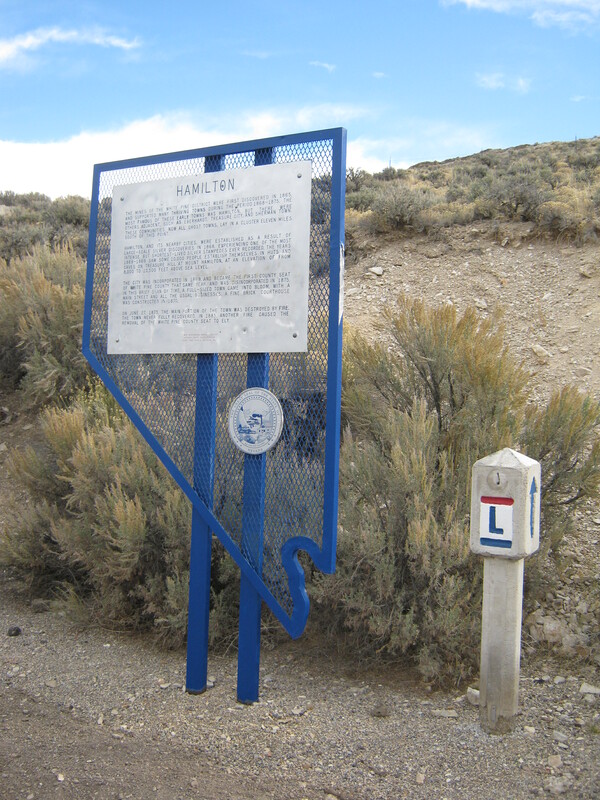 The Highway 50 location called “Pancake Summit” is properly “Little Pancake Summit”. 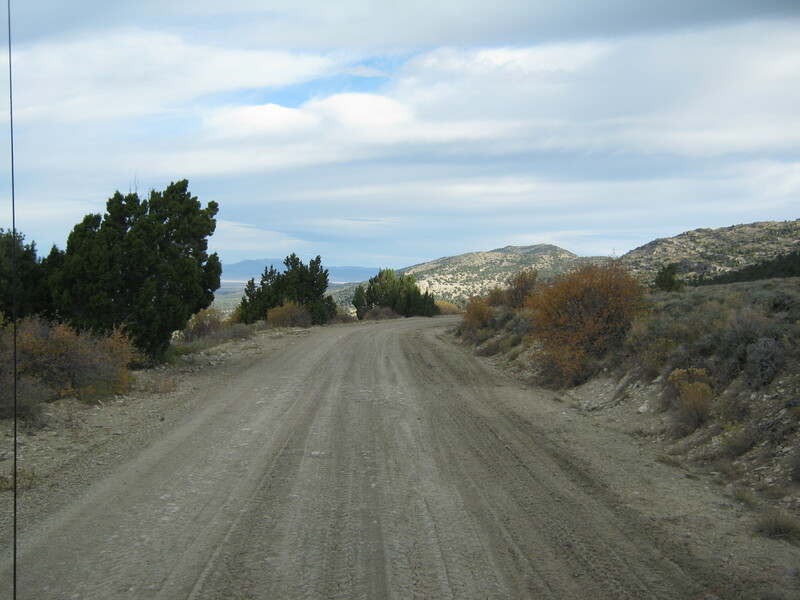 The road from Coyle’s Ranch leads across the flats to the original pass. I have not driven this but plan to do so this summer. If you are going to go there, please use caution. Do your research. Take a buddy and so forth. 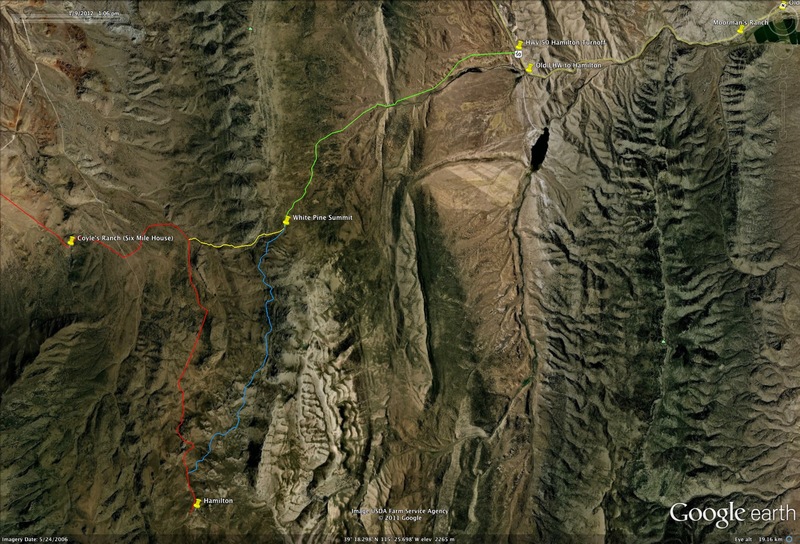 If any of you have done this road all the way to Fourteen Mile House, I would love to hear from you. 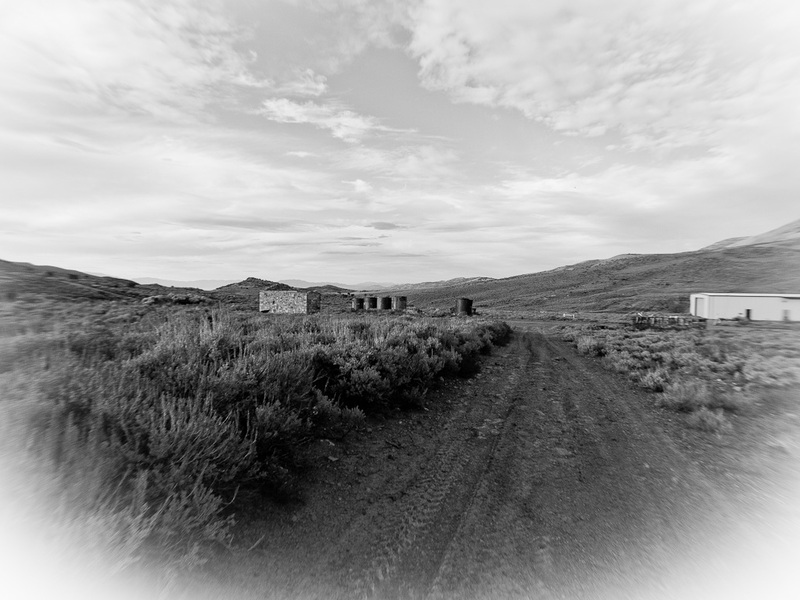 This entry was posted in Desert, Lincoln Highway, Loneliest, Loneliest Highway in America and tagged Belmont Mill, Coyle's Ranch, Hamilton Nevada, Lincoln Highway, White Pine Summit. Bookmark the permalink.